A retail property in Elsternwick has been acquired for nearly $8 million on a yield of less than five per cent, according to The Australian. 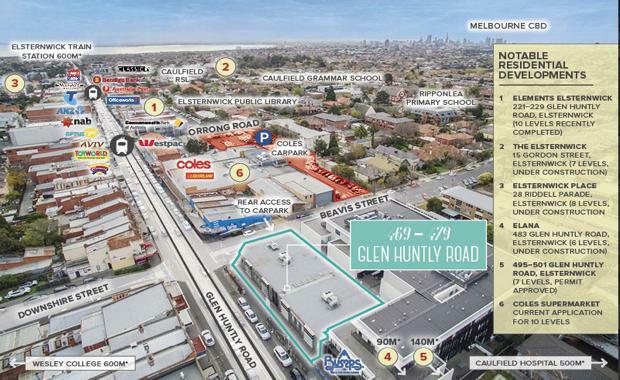 A local investor purchased the property at 469-479 Glen Huntly road, Elsternwick. The agents for the sale were CBRE's Mark Wizel, Rorey James and Josh Rutman. Mr James told The Australian: "With over 115 inquiries received from a range of local and offshore investors, it was really clear to see how aggressive the market is at present to acquire secure income producing assets in these locations. "The property offers 39m of corner frontage onto the popular Glen Huntly Road and 17 car parks. It is fully leased to six retail and office tenancies, with an annual return of $398,000. 469-479 Glen Huntly Road is a 776sqm land holding and is locate close to the ‘Element Elsternwick' residential tower and Coles supermarket.